We woke up this morning and discovered a chill in the air. Maybe "chill" is too strong, but suffice to say it is not 85 degrees with 98% humidity. It is refreshing and clear. It feels like . . . Fall. It is such a relief when the temps drop below 90 for the first time in what feels like an eternity. I'm not delusional. I realize it will warm up again throughout October. But I will enjoy this day or two of splendid Fall bliss. And to celebrate we'll do what we always do to commemorate our first "cold" snap: we'll have soup! This is the perfect Fall soup. It is a one-dish wonder which means less time cleaning the kitchen and more time in the yard throwing the pigskin around. Yes, I just said "throwing the pigskin." See - I am simply giddy with excitement! I will restrain myself just long enough to share this recipe but then I'm going to get out and frolic about the bayfront! Heat a large saucepan coated with cooking spray (or a glug or two of olive oil) over medium-high heat. Add carrots, onion, garlic, and kielbasa, and saute 3 minutes, stirring occasionally. Reduce heat to medium, and cook 5 minutes. Add broth, Italian seasoning, pepper and beans. Bring to a boil, reduce heat and simmer 5 minutes. Place 2 cups of soup in a food processor (or use immersion blender) and process until smooth. Return the pureed mixture to pan. Simmer and additional 5 minutes. Remove soup from heat. Add spinach, stirring until spinach wilts. Easy-peasy! 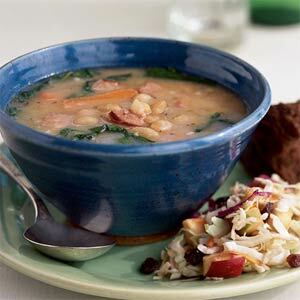 Love this recipe and the soup is wonderful and satisfying. I serve it with a crusty bread or some warm pumpernickel. And while I think the country apple coleslaw looks like a nice accompaniment, what's the point of a one dish wonder if you have to make a side dish. Enjoy! The soup and this gorgeous day!